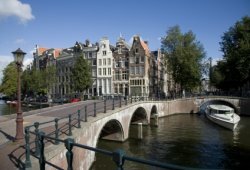 Experience Amsterdam - What's The Real Amsterdam Experience? To experience Amsterdam, one should aim to fall into the warmth of the Dutch gezellig. It is said (proudly) that there is no English equivalent to this word that may described as "a cozy atmosphere among friends." But, if you are gezellig-envy but are sans Dutch friends or family, worry not. The small streets and spaces of the City Center and open pleins (squares) are meant for all to enjoy and embody the cozy Amsterdam experience. Here are some of the top things to do in Amsterdam. The beautiful city center of Amsterdam is quite easy to identify as the city's streets are concentrically aligned around Central Station, the people's port into the city. From Central Station, one is immediately greeted by the typical, canal house architecture. Behind this wall of charming buildings is Dam Square, an open-space for street performers and the Royal Palace. A few blocks further is the notorious Red Light District, the gallery of prostitutes which is a must-see if you really want to experience Amsterdam. It's next to the Old Jewish Quarter with fun outdoor fleamarkets. The coffee shops (read: marijuana/hash houses) are dispersed through the city. Allow yourself to wonder around on foot or bike but of course, the bike is the best way to experience Amsterdam. Tip! Take a walking tour on your first day in Amsterdam to get to know the city. If you didn't bring your own bike on your trans-Atlantic flight, there is no need to worry. 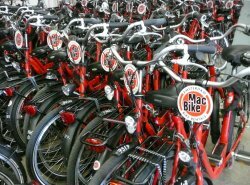 Check out Green Bikes to rent a bike. There are three rental shop locations in the center, including one at Centraal Station and one at Leidseplein. You also may be approached by a stranger on the street offering you a chance to buy a bike for 15 euros. If you are caught buying one of these stolen bikes, you may suffer legal consequences. Besides, the quality of these bikes is extremely questionable. Tip! A fun way to explore Amsterdam and its surroundings is by going on a bike tour. Anyone who wants to experience Amsterdam must visit the canals. The names of grachten (canals) are just as important as the names of straten (streets) in Amsterdam. The four notable ones are Singel, Herengracht, Keizergracht, and Prinsengracht. Taking a tour boat through the grachten of the city is a relaxing way to experience Amsterdam. Many of the ports of the tour boats are scattered throughout the city. It is a good idea to consider your budget and schedule as well as the weather when considering which tour boat to choose. The Canal Bus' Hop-On-Hop-Off boat offers tickets good for 24 hours and the options to hop on or hop off at 14 throughout the city. Stops include major museums and attractions. Buy your ticket at one of the four pick-up ports, Central Station, Leidseplein, Rijkmuseum, and Anne Frank House. Offices open at 10 am. Canal company also has Canal Bikes, pedal-powered bikes good for two to four people. Canal Company's boats are ideal for sunny or rainy weather since there is both a closed space and a non-covered space. 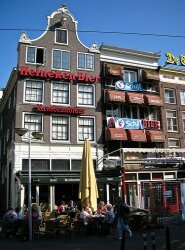 There are also cheaper, though less-flexible options starting at 12 euros such as Rederij Lovers which departs from the westside of Central Station. Tip! 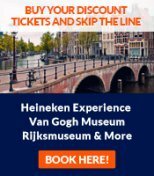 Get a museum and canal cruise combination ticket for a good price. 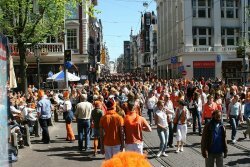 Located at the end of Leidsestraat, Leidseplein is a popular center for nighttime fun. But, feel free to arrive before the sun goes down. With a multitude of theaters, al fresco cafes, coffee shops, and clubs, there is plenty to keep one entertained. Let the famous Café Americain, located in the Hotel Americain be an apéritif to your evening. Enjoy a coffee or desert inside its sophisticated coziness, or sip your wine on the terrace - a great way to experience Amsterdam. Some may find the Leiseplein a bit overwrought, however. If feeling overwhelmed by the crossroads of tourists and trams, escape into a melodic haven. Slip into one of the music hubs, jazz at Alto Jazz Cafe (Korte Leidsedwarsstraat 115), an eclectic mix of blues and jazz at Bourbon Street (Leidse Kruistraat 6-8), or a sing-along at the Maxim piano bar (Leidse Kruisstraat 35). Also in the neighborhood is Holland Casino Amsterdam (if desiring the theme of legal counterculture). For entertainment in a more official venue, consider the diverse line-up at Melkweg (Lijnbaansgracht) or a rock or hip hop at at Paradiso (across Leidseplein, along Weteringschans). Boom Chicago, the best of the city's comedy clubs, hosts its acts in the old Leidsepleintheater. The Stadsschouwburg, a redbrick construct of the late 19th century, provides a stage for international dance and theater. What was once a site for the butter market hundreds of years ago, continues its commercial zeal with a diverse bar selection and fast-food venues. In this race for tourist dollars, however are a few gems to seek refuge. Relax amidst Art Deco and talk of intellectuals at Cafe Schiller (Rembrandtplein 26). Or, read a book at the English library bar at restaurant and club De Kroon (Rembrandtplein 17-I). One need not see a movie in order to enjoy Tuchinski Theater (a few hundred meters from the Rembrandtplein), a theater designed by Abraham Tuschinski. Tuschinski was a Polish Jew who came to Amsterdam post-World War I and later died in Auschwitz. His goal of designing a unique theater was achieved, resulting in a lavish art deco creation that humbles most interiors in the city. Entering the foyer is free, though there are also guided tours in the summer. If you are sick of seeing the same wooden shoes for sale, but can't bear to go home empty handed, then bypass the seedy souvenir shops and go to the typically Dutch neighborhood Spiegelkwartier, near the Rijksmuseum. Little art and antique shops in varying themes provide opportunity to take home a piece of creative ingenuity for those unimpressed by mass-produced souvenirs.